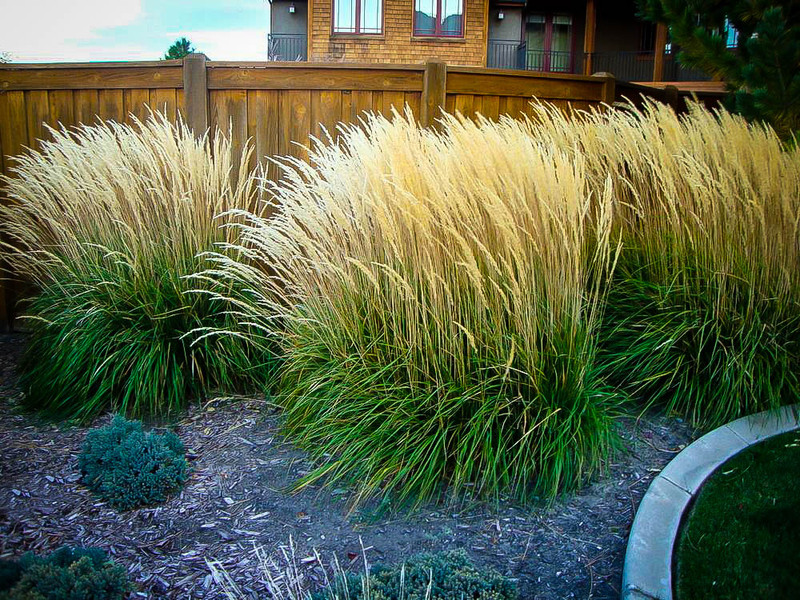 Karl Foerster Feather Reed Grass is a hardy, easily grown grass that is one of the most popular of all the ornamental grasses. It forms a dense clump of green leaves, topped with tall, upright stems of nodding seed-heads, that are soft-purple to begin with, and then turn sandy-brown, lasting for months, even into snow. This plant is incredibly hardy, thriving from zone 3 to zone 9. It begins to flower early, so even in areas with a short growing season you can be sure you will have plenty of beautiful stems to look great in the garden, or to cut for flower arrangements. Plant this grass as a specimen, in groups, or as an informal hedge, swaying in the breezes. 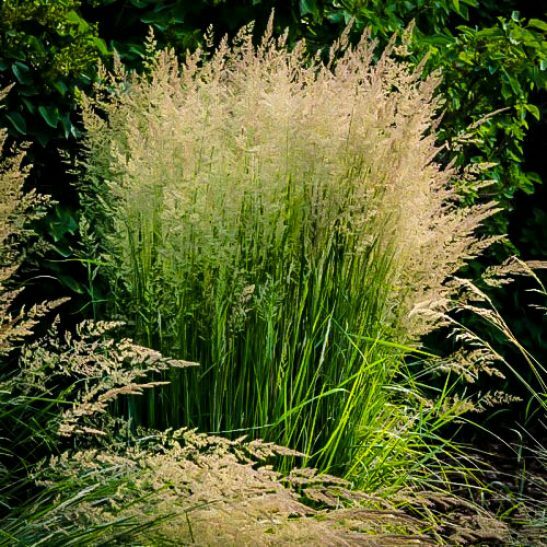 Grow Karl Foerster Feather Reed Grass in sun or partial shade. It thrives in all soils, including clay, and grows tallest in damp soil, even growing in those difficult wet spots, or along a stream. It is a clump-forming, non-invasive grass, that will not spread and take over parts of your garden. Although it has many beautiful seed heads, the seeds are sterile, so it will not germinate and cannot become a weed in your garden, or in surrounding areas. This plant is not eaten by deer or rabbits, and it has no significant diseases or pests. 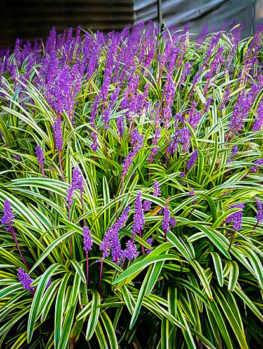 For a dramatic accent in your garden, with an easy to grow, cold-hardy, tough, and trouble-free plant, this is a top pick of the ornamental grasses. Karl Foerster Feather Reed Grass is one of the most popular, easily-grown and attractive ornamental grasses available. It grows all across the country, it is non-invasive, and it gives a dramatic, ever-changing vertical accent to any part of your garden. 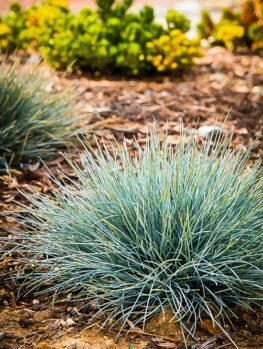 If you are a beginner with ornamental grasses, or a more experienced gardener, this is one grass you cannot be without. 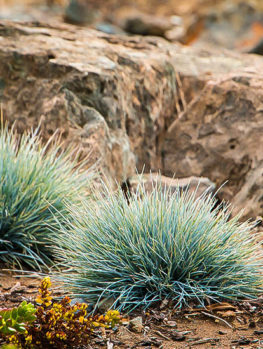 Ornamental grasses have been the ‘hot item’ in the world of gardening for some years now, and they bring unique qualities that compliment other garden plants perfectly. Unlike flowers, they are attractive for most of the year. They remain relatively small, and fit perfectly among shrubs, adding texture and variety. They need no special care, in fact many are very low maintenance, and for all these properties and more, Karl Foerster Feather Reed Grass should be your first choice. Although grasses do not produce colorful flowers, they add a wonderful look to your garden, rustling and swaying in the breezes, attracting birds that feed on the seeds, and giving a natural look anywhere they are planted. 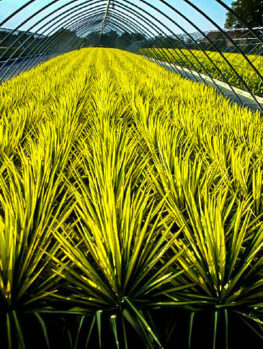 They are used in all garden styles, from ultra-modern minimalist designs to lush flower-filled borders. They look terrific in a formal garden too, contrasting with clipped plants, or in a natural garden, looking like they have always just been growing there. Karl Foerster Feather Reed Grass is an upright-growing grass, with narrow, deep green leaves, forming a dense clump that does not spread and invade surrounding areas, as other less-desirable grasses do. 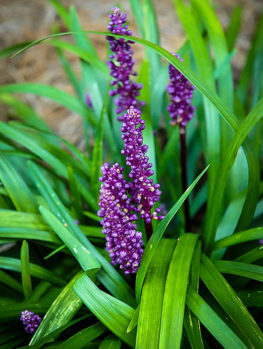 Early in the season, that clump sends up many strongly-vertical flowering stems that begin green but turn purplish and then become light-brown as the seasons progress, bringing subtle variety to your garden every day. 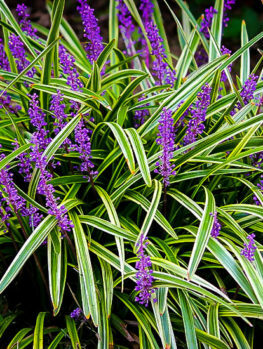 This plant creates an intense vertical accent, that contrasts and compliments other, more rounded plants perfectly. Depending on soil conditions it will grow 3 to 6 feet tall but staying as a tight clump just 2 or 3 feet wide. This makes it ideal in smaller spaces, or for mass-planting over larger areas. This is one of the earlier sprouting grasses, growing best in cooler areas, and it also begins to flower much earlier than other grasses. Since it is hardy to zone 3, and possibly even to zone 2, this early blooming habit makes it ideal for regions with shorter growing seasons, where you can be guaranteed to see flower stalks develop fully before fall arrives. Because the stems grow so vertical, they often stay upright after snow has arrived, adding interest to the winter garden. The stems can also be cut at any stage of their development and used fresh or dried for flower arrangements. 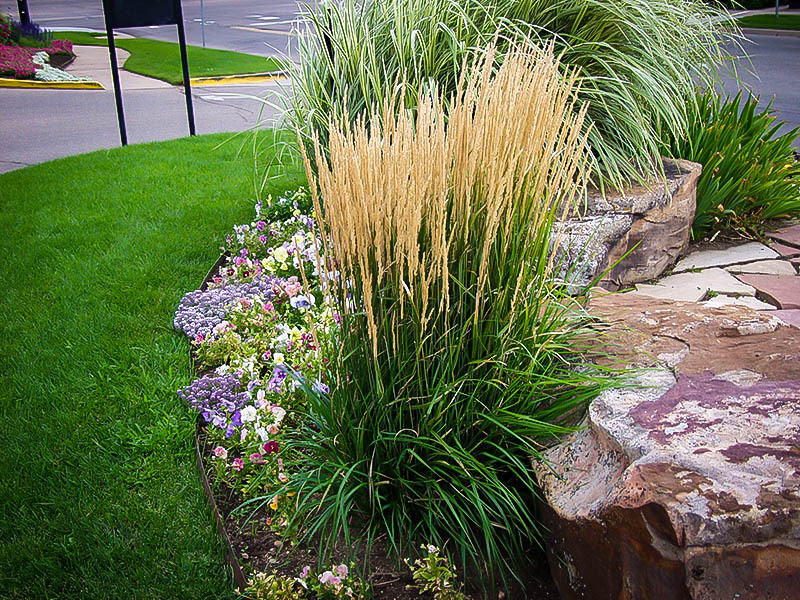 Use Karl Foerster Feather Reed Grass as a specimen in a lawn area. Plant it among other plants in beds, perhaps behind flowering plants or roses. Plant a row as an informal hedge, or a low screen to hide an area such as a vegetable garden. 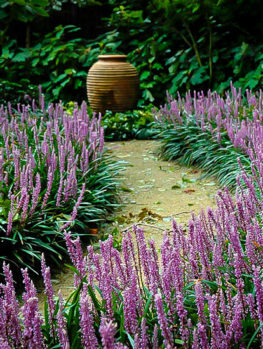 It looks especially effective in groups, planted in random clumps or drifts among other plants. It can also be planted in containers, alone or surrounded by smaller plants. This grass will grow equally well in full sun or partial shade. It thrives in wetter soils, even growing in flooded places. 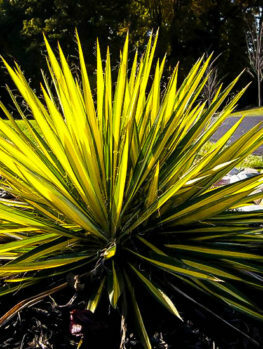 Indeed, it grows largest with a steady supply of water, although mature plants are moderately drought-resistant. It grows in any kind of soil, including difficult clay soils, with poor drainage. Unlike some other grasses, it forms dense clumps, without spreading outwards, or invading surrounding areas. The seed heads are attractive, but the seed is sterile and will not become a weed. This grass is free of significant pests or disease, and it is not even eaten by deer or rabbits. Karl Foerster Feather Reed Grass is a natural hybrid between two other grass species, Calamagrostis arundinacea and Calamagrostis epigejos. These grasses grow in Europe and eastern parts of Asia, and sometimes they naturally cross. The hybrid is called Calamagrostis x acutifolia. Because the hybrid is sterile it is only rarely found, however in the 1930s it was discovered growing in the Hamburg Botanic Garden, by a nurseryman called Karl Foerster. After the war was over, Foerster introduced it to gardeners, and even since then it has been a top favorite. It was Perennial Plant of the Year in 2001, a tribute to the many wonderful things this plant brings to gardens. Our plants are produced by division of correctly-identified plants, and they are guaranteed to be the genuine plant, not a cheaper seedling form. Today, this wonderful grass is at the top of every knowledgeable gardener’s list, especially those who live in colder areas, so our stock will quickly be reduced. Order now while we can still satisfy your requirements.